Photo by Public Information Office. A team of young innovators from Cornell University and Dartmouth College designed an app called “Walk Safe,” which can track vehicles’ relative speeds at crosswalks and indicate if it is safe to cross. The app is designed to identify oncoming traffic while the user is using the phone. The addition of Japan to the Trans-Pacific Partnership negotiations, a trade agreement consortium, would boost Japanese vehicle exports to the United States by $2.2 billion a year. This gain for Japan is forecast to lose 26,500 American jobs in the auto-manufacturing value chain and cut the American production of vehicles by 65,000 units. The global electric bus market will grow 26 percent annually by 2018, a new report indicates. 75,000 vehicles will be roaming world streets by that time, mostly in North America, as fuel costs continue to rise. New York’s long-under-construction 2nd Avenue subway project incurred an unexperienced setback as underground construction blasts broke through to the street surface on Wednesday. The blast, which was part of scheduled construction, sent debris and metal plates into the air in Manhattan’s Upper East Side. It will halt construction only in the immediately affected area. No one was hurt in the blast. BMW rolled out its premium carsharing service, DriveNow, in San Francisco. Seventy electric BMW ActiveE vehicles will be located across nine DriveNow stations across the city. A full-scale version of the luxury carmaker’s program is available in Munich, Berlin and Düsseldorf to some 45,000 registered users. A new, 2.1-kilometer bus rapid transit (BRT) service opened in Miyagi Prefecture, Japan. Local trains that serviced the area have been suspended due to last year’s tsunami and earthquake. The initial stretch will connect two train stations and may be expanded in the future. Legal analysis suggests that an organized crime group may have made millions of crowns (one Czech Crown is about $0.05) in corrupt government contracts for Prague’s transit services. The debate over the utility of New York City’s bicycle lanes seems to be near a close as recent polling by the New York Times indicates a 66 percent approval rating, with majority support in all of the city’s five boroughs. Long Beach, Calif., the second largest city in Los Angeles County, will roll out a 2,500-unit bikeshare fleet this February. Long Beach, which dubs itself “the most bike friendly city in America,” has invested $20 million in new cycling infrastructure, creating 130 miles of bike paths and 1,300 bike racks throughout the city. As Detroit continues to deal with urban decline, new strategies have been launched to deal with the 1.3 million person population decline the city has experienced in recent decades. Plans to reduce upkeep on completely unused public infrastructure, including road repair reduction and streetlight removal are ongoing, as the city’s long term planning team “triages” blighted neighborhoods. Israeli authorities have backtracked on efforts to designate the polluted skies over Haifa, northern Israel’s biggest industrial center, in complying with an 18-month-old Clean Air Law. A statewide bill requiring drivers to give cyclists three feet of leeway when passing them will be voted on today in the California State Assembly. California’s upper house, the Senate, voted to approve its version of the same legislation in May. The Roads and Transport Authority of Dubai began a program sending text messages to bus drivers to “keep them motivated.” The text messages, sent and read by drivers during operations, is desinged to lift morale and achieve higher levels of safety for passengers and drivers. 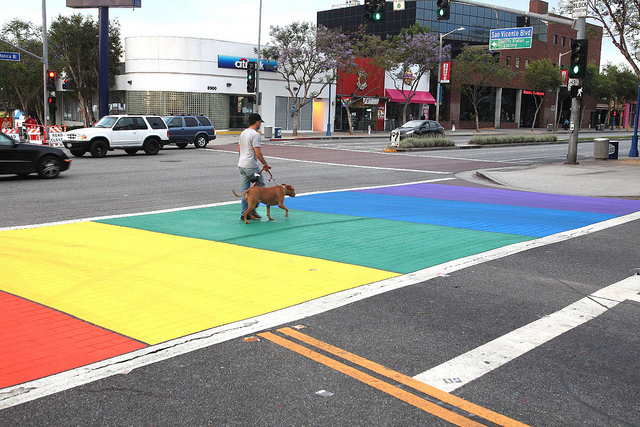 In an effort to brand a municipality with its major pedestrian crossings, the City of West Hollywood in Southern California will make permanent its rainbow-banded crosswalks installed for this year’s Gay Pride Parade. The city, long an LGBT haven, will coat its rainbow crossings in thermoplastic, to avoid pedestrian slipping.